Thyrotropin-releasing hormone (TRH). TRH is produced in a region of the brain called the hypothalamus, which monitors and regulates thyrotropin (TSH) levels. Thyroid-stimulating hormone (TSH). TSH, also called thyrotropin, is secreted by the pituitary gland. TSH directly affects the process of iodine trapping and thyroid hormone production. When thyroxine (T4) levels drop even slightly, the pituitary gland goes into action to pump up secretion of TSH so that it can stimulate T4 production. When T4 levels fall, TSH levels increase. Thyroxine (T4). T4 is the key hormone produced in the thyroid gland. 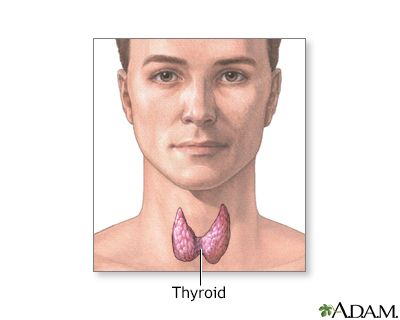 Low levels of T4 produce hypothyroidism, and high levels produce hyperthyroidism. Triiodothyronine (T3). Thyroxine (T4) converts to triiodothyronine (T3), which is a more biologically active hormone. Only about 20% of T3 is actually formed in the thyroid gland. The rest is manufactured from circulating T4 in tissues outside the thyroid, such as the liver and kidney. Once T4 and T3 are in circulation, they typically bind to substances called thyroid hormone transport proteins. After having their effect in various parts of the baby, the thyroid hormones are later inactivated and the iodine is recycled to form new thyroxine. Hashimoto thyroiditis. This is an autoimmune condition in which the body's immune system attacks its own thyroid cells. Overtreatment of hyperthyroidism (an overactive thyroid). An enlargement of the thyroid gland, called a goiter, is almost always present and may appear as a cyst-like or fibrous growth in the neck. Hashimoto thyroiditis is permanent and requires lifelong treatment. Both genetic and environmental factors appear to play a role in its development.The other main type of autoimmune thyroid disease is Graves disease, which causes hyperthyroidism (overactive thyroid). Many people who receive radioactive iodine treatments for an overactive thyroid develop permanent hypothyroidism within a year of therapy. Radioactive iodine is the standard treatment for Graves disease, which is the most common form of hyperthyroidism, an autoimmune condition resulting in excessive secretion of thyroid hormones. Unhealthy cholesterol levels. Hypothyroidism raises levels of total cholesterol, LDL (bad) cholesterol, triglycerides, and other lipids associated with heart disease. Treating the thyroid condition with thyroid replacement therapy can significantly reduce these levels. High blood pressure. Hypothyroidism can slow the heart rate, reduce the heart's pumping capacity, and increase the stiffness of blood vessel walls. These effects can lead to high blood pressure. Everyone with chronic hypothyroidism, especially pregnant women, should have their blood pressure checked regularly. Heart failure. Hypothyroidism can affect the heart muscle's contraction and increase the risk of heart failure in people with heart disease. Pericardial effusion. Hypothyroidism sometimes leads to the buildup of fluid in the sac that surrounds the heart, known as a pericardial effusion.